Bringing your market lamb up to weight is a multi-faceted endeavor that goes beyond feeding the animal to encompassing its lifestyle and overall health. While there is no one correct way of cultivating a fair-worthy specimen, a lot can go wrong. You must know the innate challenges of rearing market lambs. If you are raising your market lamb for a show, you can take specific measures to reach a target weight and build muscle. However, some lambs may not grow under the best of conditions and individual lambs vary in their genetic potential for weight gain. Give your market lamb adequate shelter. Your lamb must have an environment that encourages its growth. This means your lamb should have plenty of pen space, good ventilation, protection from exposure to the elements and cool, fresh water. Feed your market lamb a balanced diet, with particular attention to minerals. 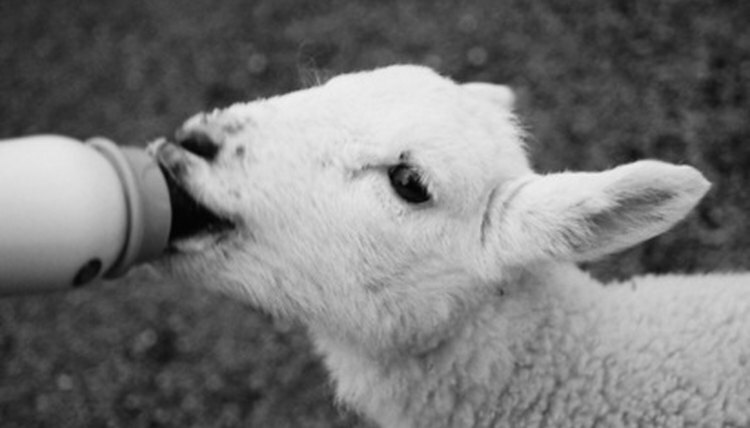 Give your lamb trace mineral salts designed specifically for sheep, as these are not interchangeable and cross-contamination with salts designed for other animals can result in copper toxicity. Selenium tends to be a critical mineral that sheep need, so include this in your lamb's feeding program. Make sure calcium and phosphorus are present in the lamb's diet in the ratio of 2:1. Roughage has high proportions of calcium to phosphorus and can be useful to market lambs. Imbalances can result in the formation of urinary calculi. Increase the amount of feed gradually. Find out from the previous owner of your lamb what sort of diet it had. Drastic changes can stress your lamb or upset its digestive system and even cause the animal to die. Stick as close to how the lamb was initially fed as possible and introduce changes slowly to minimize trauma. Increase the amount of grain you feed the lamb by 1/8 to 1/4 pound over three or four days, on the same schedule, weighing out and splitting the total ration between two meals spaced 12 hours apart. Supplement with probiotics to aid digestion. Monitor your market lamb and weigh it weekly. Weigh your market lamb in the morning before feeding and note the change from the previous week's tabulation. If the lamb's calculated daily gain falls short of expectation, consult with a seasoned market lamb expert about making adjustments in the lamb's weight gain program. This could require implementing some change in the facilities, making a change in the quantity or composition of the ration or treating a specific health concern. Make adjustments and limit-feed if the market lamb gets too large. In preparing your market lamb for showing, you might find that your lamb is getting too big too quickly, or off schedule. In this case, you can add oats to the ration to lower the energy profile. Alternately, ration the lamb on pasture or hay, although this could result in unattractive "hay belly." But do this midway to presentation and finish the lamb on concentrated feed prior to the show for a leaner appearance. Lambs that are too fat also can be limit-fed by increasing the proportion of a normal ration's protein content. Start the exercise program about two or three months before the show. Exercise your market lamb early in the morning or later evening, when it is cooler. This will prevent the lambs' overheating. Allow the market lamb to adjust to the exercise program by building duration and type of exercise. Regulate intensity of the workout and aim for short, intense sessions of distances between 350 and 450 yards to build and tone muscle. Work the lamb just enough to get adrenaline pumping through its body, but do not overwork the animal as this could break down muscle. Tailor the exercise according to the individual lamb's needs and your muscle-firming and weight-gain goals. Set up obstacles for your market lamb to jump over to develop the leg and loin area. Guard against potential injuries and avoid making your lamb jump several obstacles at a time. Run your market lamb to firm and harden the finish, or the back fat. Do not exercise a market lamb that is underweight close to the day that you will show it. On the other hand, exercise could benefit and tone a heavier lamb.